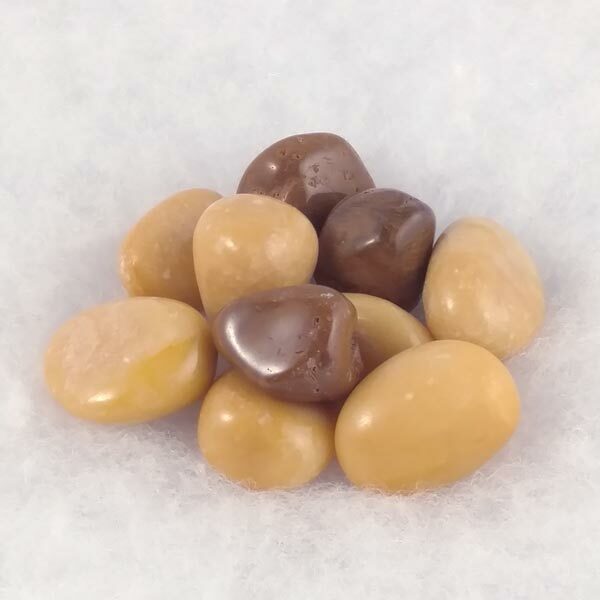 Tumbled Yellow Jasper healing gemstones that are a rich, golden, sandy color, with some leaning to more almost brown shades. Yellow Jasper helps to calmly pursue and achieve goals and can be used to facilitate and reinforce a state of tranquility by removing worries and distress. Size: 3/4 to 1 inch. A movement Chakra. Protects and repairs the double aura from the groin area down through the thighs, legs, knees and feet. Protects those whose movement on their life path is vulnerable to distraction or scattered thinking. 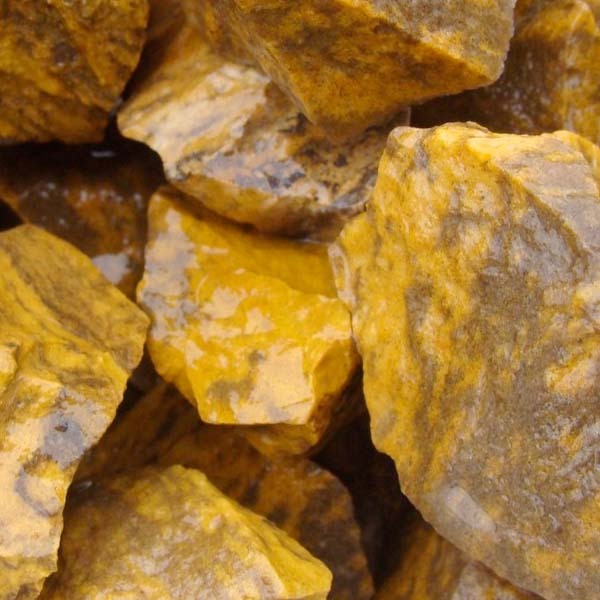 Yellow Jasper has a Trigonal crystal system and is in the mineral class of oxide, the quartz group. Its coloring is yellow, sandy and going to almost brown. The darker, leaning to a purple, stripes show nicely the sedimentary manner that this stone is formed. The term of Jasper originated from the orient. In the Middle Ages it meant the same as our present day word of Quartz. Even today, colorful stones that are hard to identify often times are called Jasper. An example would be Silver Eye Serpentine being referred to as Zebra Jasper. Like most gems, Yellow Jasper is most beneficial when worn or laid upon the body. It will need to be worn for long periods of time since its effects, like most Jaspers, accumulate gradually over time. Yellow Jasper helps to calmly pursue and achieve goals. It can be used to facilitate and reinforce a state of tranquility by removing worries and distress. Yellow Jasper helps promote endurance and to recognize that action can modify results, not worry. It brings the insight necessary in finding the beneficial action needed to resolve a concerning situation. Yellow Jasper enhances our courage to come to grips with unpleasant tasks by stimulating the imagination and transforming ideas into action. Yellow Jasper fortifies the immune system and removes blocks in the energy path that have lead to poor circulation and disorientation. Even though it works slowly, it is an energizing stone which, over time, will provide a stronger and better physical condition. Yellow Jasper has a special affinity with Aries, but benefits all signs and is good for anyone wishing to channel positive energy. Its Energy is Electric, its Planet is Mercury and its Elements are Air and Fire. Yellow Jasper has been used for quite some time to clear the mind and promote a "life focus" for its user. It has been found to be especially useful to children who are "accident" prone or in that clumsy stage of life. There is not a lot of written history with this particular stone which may be due to it being referred to as a Sandy Chalcedony in earlier times. Like most in this family of stones, it has gone by many names and I believe from her color description, Melody refers to this one as "Wonderstone".